This event was held at Temasek Polytechnic Business School Auditorium 3 on 20th October 2012, 12 - 5 pm. 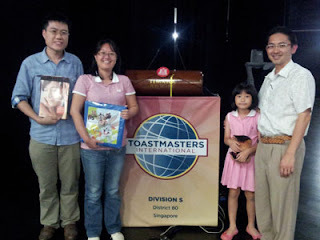 Our Club President, Swee Tiong, his daughter, Our new member Oscar Zhu and Rachel Won attended the Contest. It was an enlightening, entertaining and enriching contests. We received the nuggets of wisdom and hilarious humor from the contestants, delicious lunch and tea break and out of surprise, Oscar and Rachel won both rounds of lucky draws. Isn't that wonderful? We are indeed lucky to receive the gifts prepared by the Organising team of the contest. Thanks for their effort to make the event a Success. It was indeed a rewarding and wonderful learning journey.